This month North Coast Creations is releasing two Christmas stamp sets - Santa's Sleigh and Old Fashioned Santa. Continue reading below to find out how you can win one of two North Coast Creations $10 Gift Certificates good towards the purchase of NCC Stamps. 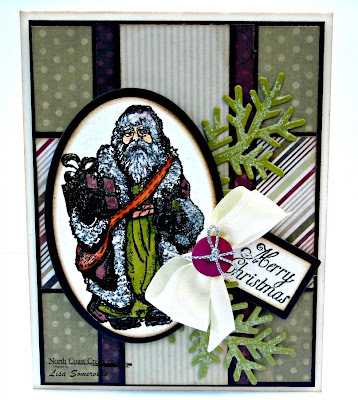 My first card uses North Coast Creations Old Fashioned Santa along with custom dies from NCC's parent comany, Our Daily Bread Designs. The Santa image is Black Embossed on Watercolor Paper, then die cut with Spellbinders Oval Dies, colored with STAEDTLER Mars Graphic Markers, and layered on a Black Oval. I added Rangers Fine Glitter to the White areas of the image, and sponged the edges of the Oval with Ranger Gathered Twigs Distress Ink. To embellish, I die cut the branch from Our Daily Bread Designs Custom Fancy Foliage Die , from Olive card stock, and added some Fine Glitter to the branch. The sentiment is from the NCC's Old Fashioned Santa, I used the omitting technique to only use a portion of the sentiment, Black embossing it on Watercolor paper, then die cutting with Our Daily Bread Designs Custom Recipe Card and Tags Die, trimming the panel so that it could be layered on the Black full sized Tag. 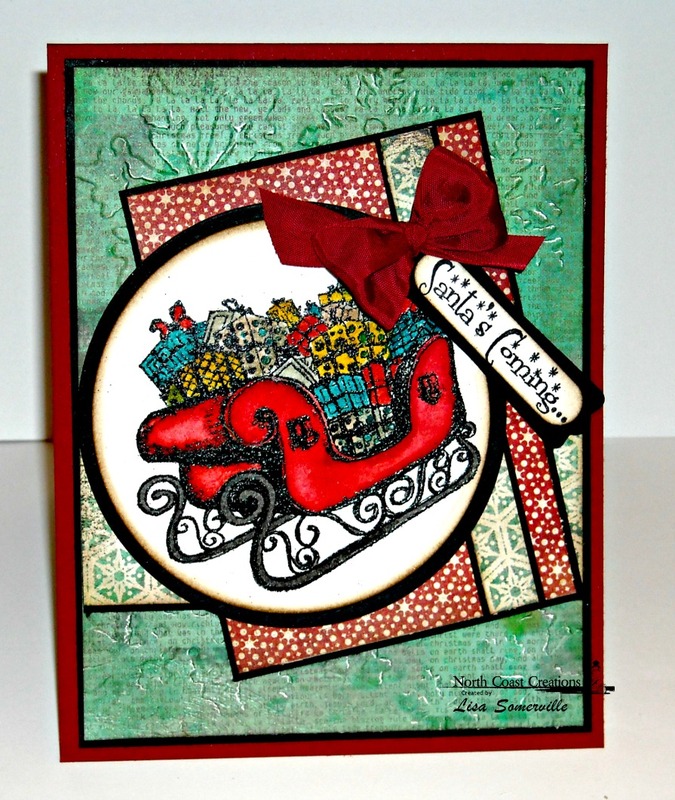 My second card features North Coast Creations Santa's Sleigh stamp set. The sleigh is Black embossed on Watercolor paper, colored with STAEDTLER Mars Graphic Markers and die cut with Spellbinders Circle Dies. The edges are sponged with Ranger Gathered Twigs Distress Ink and layered on a Black circle die cut. The pattern paper is from Basic Grey, the background panel is embossed with the Alterations Snowflake Folder. To embellish I Black embossed the sentiment from this set on Watercolor paper, cut with the Word Window Punch, layering on a Black panel and adding a Red Seam Binding Double Bow. Kelley will randomly be selecting 2 winners who will each receive a $10 gift certificate to North Coast Creations, good towards the purchase of stamps, just for commenting on the Design Team cards! You have until Monday, September 17th, at 10:00pm EDT to leave your comments. Winners will be posted September 18th, on the North Coast Creations Blog, so be sure to check back there to see if you are one of the winners! great cards. Nice set for the upcoming season. Gorgeous Christmas cards! Love how you combined all the layers with those great images! Happy Sunday! Very pretty cards, Lisa, love the embossing first in black on the watercolor paper, makes it just "pop" off the card!!! WOW Lisa ... both cards are beautiful but that vintage Santa really warms my heart! Awesome inspiration ... thanks so much! Love all the background papers you've used. Cards are beautiful! Both are wonderful, Lisa! Love the black embossing and pretty papers.Very striking w/ the black layering. Beautiful cards! I love the dark embossing! These are wonderful . LOVE how you colored them. TFS. Love the beautiful cards. The santa has a wonderful old world feel to it. Thanks for sharing. Wow, love your cards! Santa is looking ready, and his sleigh is over the top full of goodies for me, me me! Great colors, and layouts. Hi Lisa! I love both cards and both stamps sets. The vintage Santa is my favorite though!! Beautiful cards and wonderful new stamp sets. love all the sparkle! great samples, Lis!! Ooooh....great coloring on your cards! What I love about both of them is your great choice of coordinating papers! Love love both of these Lisa!!! Love all the sparkle! 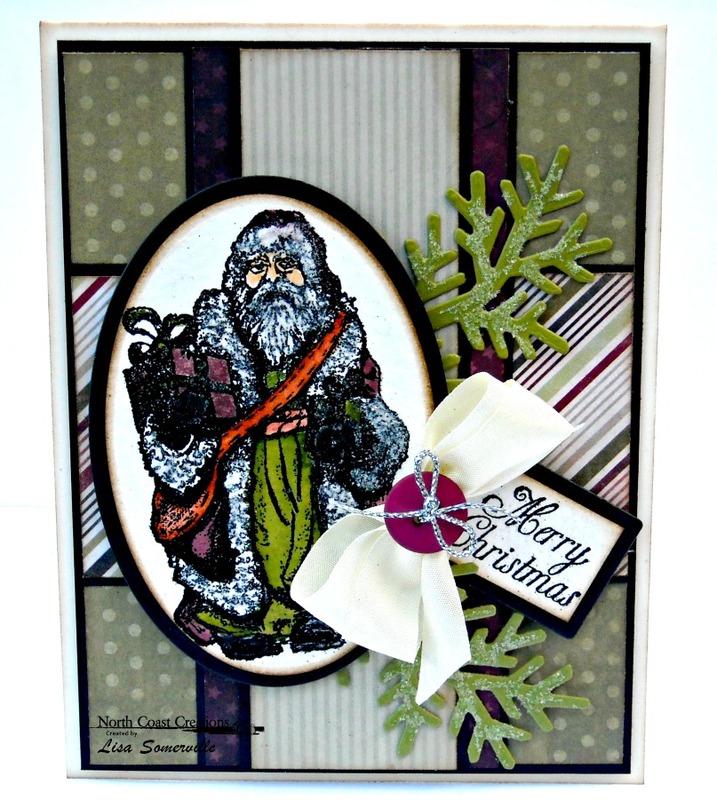 Love the way you chose to dress Santa in green, and I love the sparkle added to both cards. Great! Cool cards, so colorful!! Awesome!! Love the glitter areas! Love how you used the Fancy Foliage die with the new image on the first card. Wonderful cards. Oh my... Both cards are fabulous!!! I love the color combos!!! Both cards are wonderful. Thank you. Great cards and stamps. I am ready for Christmas stamping! I've long admired your work, and today is no different. Beautiful projects! Thanks for sharing! !